It’s rare to find good Wi-Fi hotspots, let alone 100 percent Wi-Fi connectivity in an entire area in India. Yet, Malegaon village is showing how 100 percent connectivity can be achieved in an extremely affordable manner, by using community resources and deploying sheer ingenuity and pluck. The move is already changing the lives of the people in the village, which is around 30 kilometres from Nashik near Sinnar taluka. His 19-year-old friend Pravin Kate, also an engineering student, prefers the village Wi-Fi to the network provided by the mobile phone companies, which is not only expensive but also quite spotty. “Wi-Fi in our village is free and available 24 hours,” he explained. Kate uses the Wi-Fi to access online shopping sites, search maps for location and use the search engines extensively. The interesting part is that both Avhad and Kate mainly use their smartphones to access the internet. Twenty-four-year-old Mahendra Sangale, an engineering graduate, is preparing for competitive exams to get into the government service and tutors students in his spare time. While he uses the internet for his own research, he is also teaching school students in the village to get familiar with the computer and its functions. “Many students have become proficient in PowerPoint and use a lot of images and videos from the internet in their presentations,” he said. Sangale also said that Wi-Fi access has improved the English language skills of the students. The village, which has a 70 percent literacy rate, has actually shown the path to Narendra Modi’s ambitious Digital India mission. Malegaon would have remained like any other village if it weren’t for the progressive thinking of its sarpanch Tukaram Sukhdev Sangale. He hit upon the brainwave of providing free Wi-Fi to everyone one day after reading local newspapers that had reported plans of several cities to start Wi-Fi hotspots. “When we heard that metro cities like Mumbai are implementing Wi-Fi in their own cities and giving facilities to people we though why not provide same facilities to our own people,” he explained. “Youngsters anyway access internet on their mobiles and recharge their mobiles with '100-200 coupons,” said village development officer (VDO) Sanjay Giri, who has been working in the village since 2007 and was recently felicitated with the ‘Gunvant Karamchari’ award (best employee of zilla parishad). “Since youngsters were already aware of its benefits, convincing the village panchayat was not difficult,” he added. To understand and study the logistics involved in the rollout and implementation, field trips were made to places in Nashik where Wi-Fi infrastructure had been installed. Quotations were called from service providers like Airtel and Idea, but the government-run BSNL was chosen for affordability and good connectivity. As village administrative work was already computerised and CPUs were available, four routers were sourced from a local vendor and installed on a tower. But since it covered only a limited area, another tower was set up. “Today both towers provide a range of 1.5 km for Wi-Fi access with 2mbps bandwidth. It can cater to 150 connections simultaneously,” Giri said. 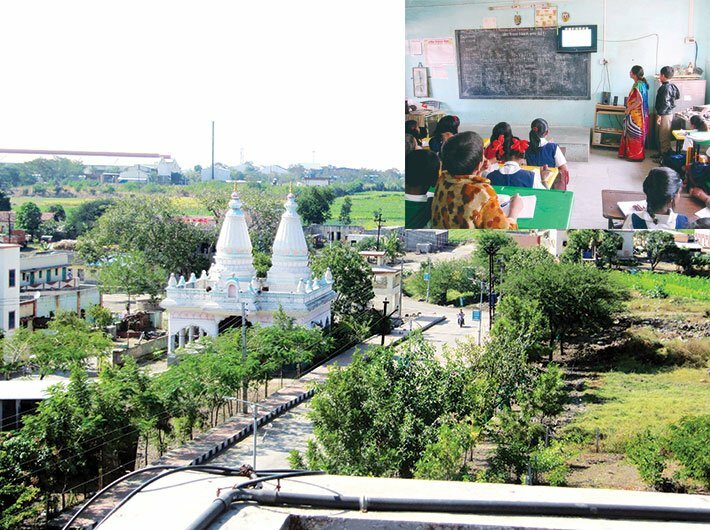 Implemented in July 2014 at the cost of '56,000, the money for the Wi-Fi infrastructure was generated from village revenue collected by way of tax from 450-500 small and large-scale industries present in the industrial belt of the gram panchayat developed by the Maharashtra industrial development corporation (MIDC). The gram panchayat received tax of '1.75 crores from these industries in 2013-14. Connections are provided free of cost and preference is given to over 9,000 bonafide residents of village. A password for access is given with a warning that any misuse of the connection will subject them to forfeiture of their connection. “Over 95 percent of the people have mobile phones, with over 60 percent of those being smartphones,” said Sangale. With a common gram panchayat for two revenue villages of Malegaon and Maparwadi, the latter with much less population, the gram panchayat is now working to spread Wi-Fi to Maparwadi too. “We have written to BSNL and asked them to provide us 10 mbps connectivity now so that we can provide connections to anyone who approaches us. Plans are also on to install three additional towers so that Wi-Fi spread becomes five kms around the village,” said Giri. Though Wi-Fi implementation has brought it much recognition, the village has been setting high standards of development for some time. Through its own Reverse Osmosis Ultra Violet (mineral water) plant installed in the gram panchayat office, 20 litres of filtered water is provided to villagers for '5. For those with pending taxes it costs '10 for the same quantity. Water meter reading is taken through a hand held device that can detect reading from distance of 100 metres so that time is not wasted in going door-to-door. The reading is directly fed into the computer with consumer details. Besides, eight CCTV cameras are installed in village. There are e-lessons prepared by Dr Vijay Bhatkar of Pune that are taught to over 900 students through seventeen televisions installed in the zilla parishad school. The anganwadi (child shelter) with digital home theatre also has a sanitary pad dispensing machine. The well-lit village with concrete roads has its own plant nursery. Garbage is collected through a vehicle and dumped outside the village in a depot. With many awards in its kitty like the Nirmal Gram Award, Paryavaran Santulit Samruddha Gram Award, and Sant Gadge Baba Gram Swachta Abhiyan Award, the village is setting an example of how local self-governance and community participation can go a long way in creating self-sustaining empowerment. Future plans include constructing a stadium on a two-acre plot of land near the village. A weather forecasting machine to help farmers at a cost of '2,50,000 is also being set up. “We must practise what we preach to others. Each person will have to work and participate in the development of country as the government cannot achieve it on its own. Though we spend as much as '56 lakh on big projects in the village we never got as much recognition as spending '56,000 on Wi-Fi connectivity. We have merely achieved 40 percent required of a model village and working to achieve the remaining 60 percent,” said proud Sangale.